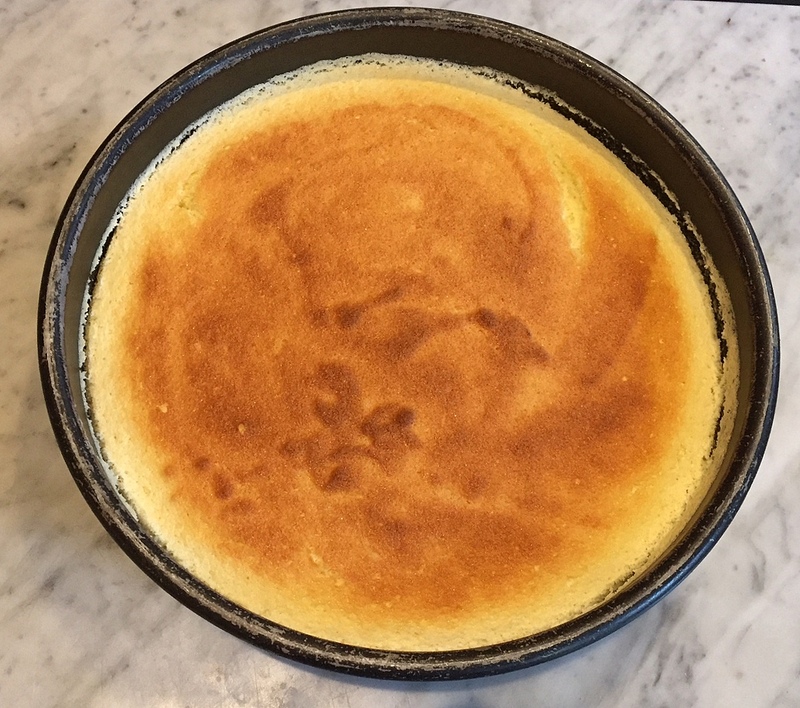 We were having friends over on Sunday so I made two round yellow things -- a frittata for the main course and this uber delicious Lemon-Cake Pudding for dessert from a c. 1940s recipe. 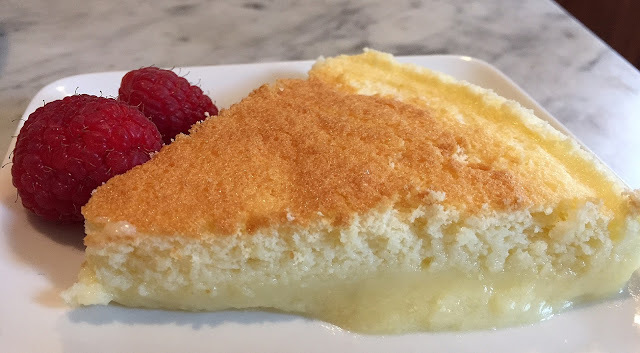 Not only was it delicious, but it was magic -- though I put just one batter in the oven, during baking it turned into two: a light delicate cake atop a lemony custard pudding. There are a few steps involved, but none are that difficult. And when the payoff is lemon magic, then it's well worth the effort. 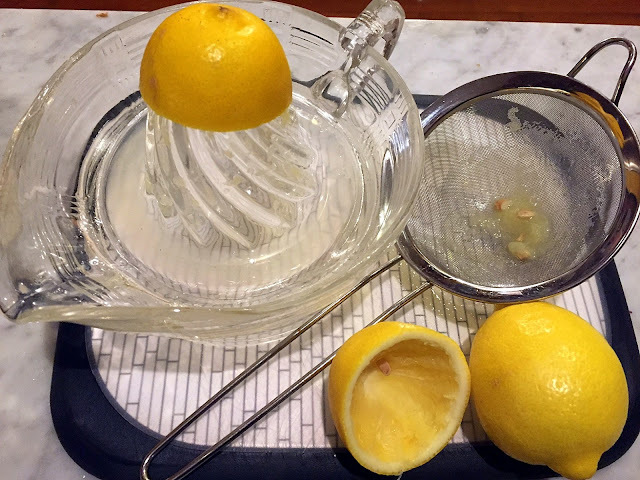 Start by juicing some lemons. Then, set out all of your ingredients. 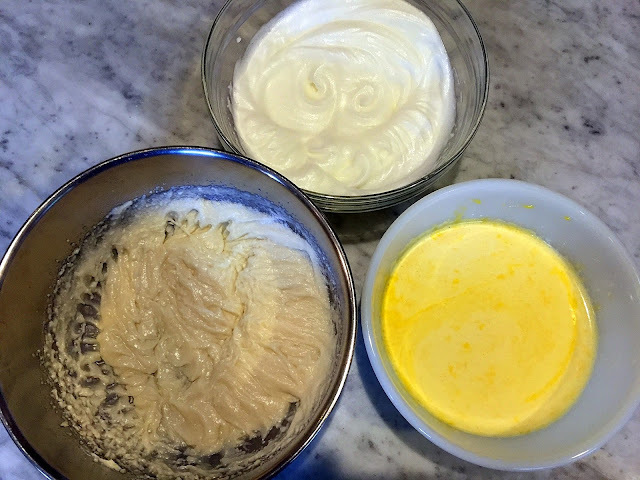 Put the dry ingredients (plus some butter) in one bowl, separate the eggs, and measure out the milk and lemon juice. After you mix all these up, you'll have three bowls -- all of which are combined in the end. The egg-milk mixture is added to the main batter. The final step is carefully folding in the egg whites. I always add a bit of cream of tartar when I beat the whites, so as not to dry them out. 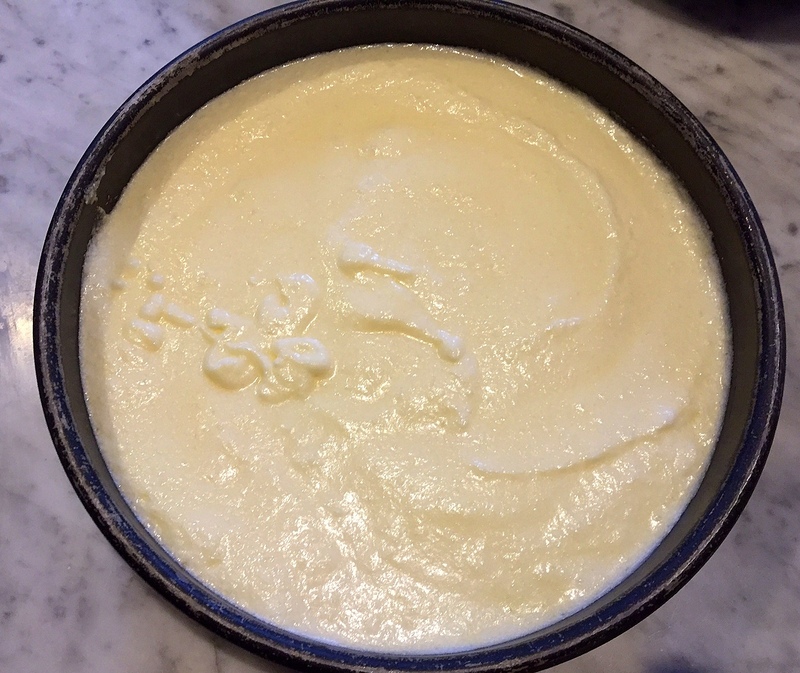 After blending, pour into the ungreased pan. Mine could have been blended a bit better; note the swirls of white. Bake for about 45 to 50 minutes. Next time, I'd bake this a bit longer than the 50 minutes I did. It's a bit messy to get the first slice out, but rather easy after that. 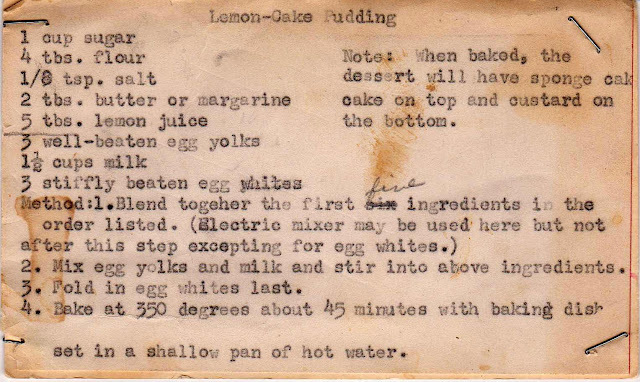 Production notes: I followed the recipe almost exactly, and have written it out below the vintage card. Juice about two small lemons to get 5 tablespoons of juice. Place sugar, flour, salt, softened butter in a bowl. Mix thoroughly. Add lemon juice and mix. Set aside. 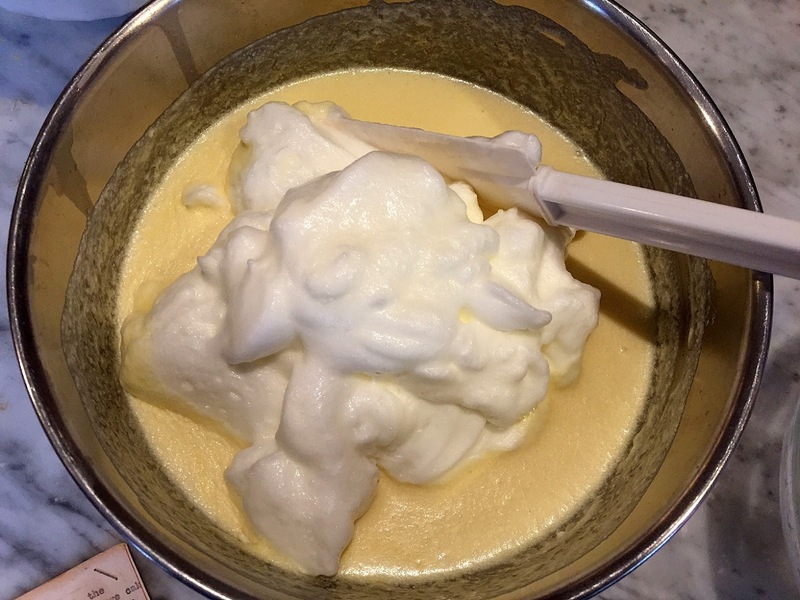 In a separate bowl, beat egg whites until stiff peaks form. Set aside. 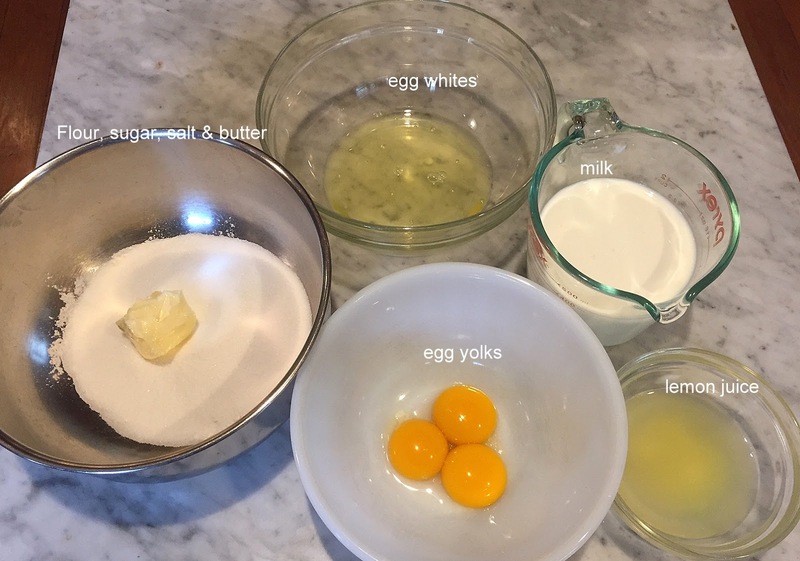 Beat the egg yolk, add the milk and combine well. Add the egg-milk mixture to the flour mixture and combine well. Pour into cake pan and place in the oven. Bake about 45 to 50 minutes. The top should be golden brown. Welcome back! Glad to see you're here again. Both of the new recipes look delicious. Have a good day, don't stay away so long next time. Hope all is well. Thanks, Mary Ellen. Glad to be back! All is well, I've just been lazy! 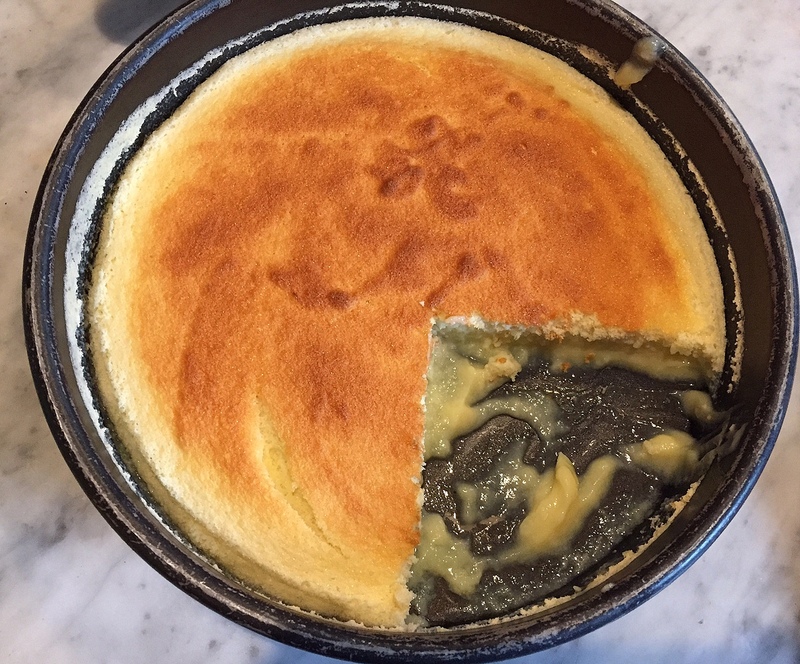 My mother occasionally made this as a Sunday supper dessert. We loved it. Good flavor AND magic! I also remember Py-O-My Pudding Cake mix in the 1950s, and perhaps into the '60s, which produced a similar dessert. (See an advert here: https://retroadverto.wordpress.com/2013/12/15/py-o-my-puddin-cake-mix-1954/) There is also a chocolate fudge version of pudding-cake that I make. (You may have posted a recipe in the past, I didn't search your list.) I've developed a sensitivity to citrus, so no longer make this lemon version myself. I should try a cherry or pineapple one. I vaguely remember Py-O-My! 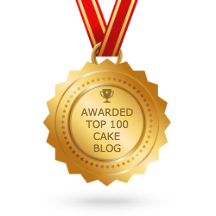 I've never heard of a chocolate version, except for the famous tunnel of fudge cake, that I did write about. Thanks for writing, Elle.